This story is part of a series focusing on Americans' confidence in various types of government, views of the political parties and of the role and power of government. Follow the series on our government topic page. WASHINGTON, D.C. -- In the first year of Donald Trump's presidency, a majority (55%) of Americans believe the federal government has too much power, down slightly from the last several years of the Obama presidency, when it hovered near 60%. Roughly a third of Americans think the government has the right amount of power, while just 7% think it has too little. These results are from Gallup's annual Governance survey, conducted Sept. 6-10. 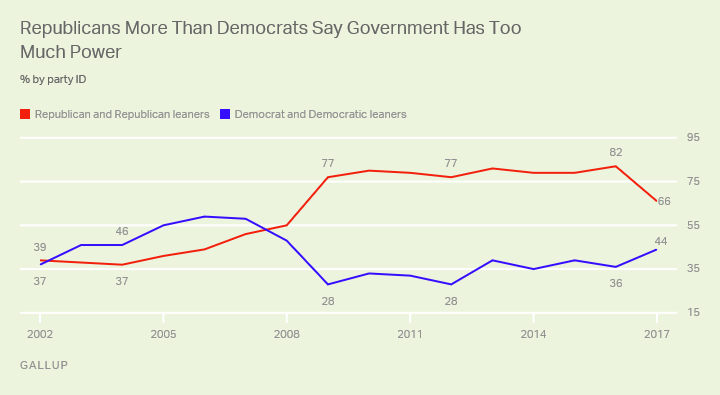 The current sentiment that government is too powerful is broadly in line with the trend since 2006 when the majority -- between 51% and 60% -- have felt this way. 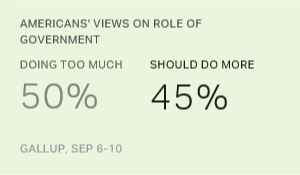 Americans expressed lower levels of concern about government power in the years following 9/11. Between 39% and 43% of U.S. adults said the government had too much power during George W. Bush's first term. However, apprehension increased as Americans' belief that the Iraq War was a "mistake" mounted, reaching a majority in 2005. Growing public concern about the Patriot Act, the law passed after 9/11 that increased the government's access to perform surveillance people living in the U.S., may have also raised public anxiety about government power. Since 2016, there has been a shift in partisan views about government power, likely reflecting the change from a Democratic to a Republican administration. Republicans and Republican leaners are now significantly less likely to say the federal government has too much power than when Barack Obama was president, while Democrats and Democratic leaners are more likely to say this. Despite the shift in partisan views, Republicans remain more likely than Democrats to say the government has too much power. Current Republican concern about government power is lower than in the Obama years, but members of the GOP are more likely now than they were under President Bush to believe the government has too much power. The views of Democrats, on the other hand, are similar to the beginning of the Bush presidency, but not as negative as they were at the end of that administration. 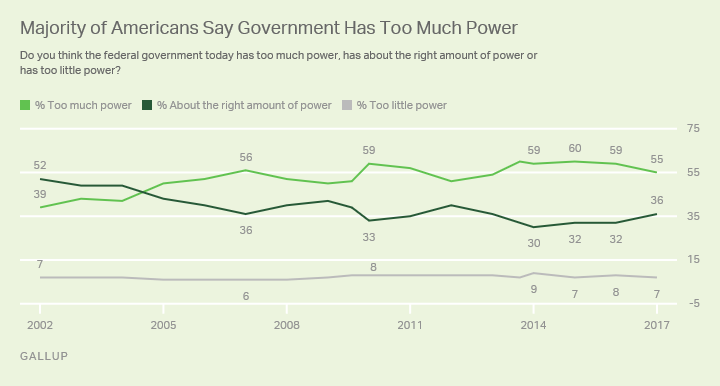 Over the last decade, Americans have generally said the federal government has too much power. Since 2016, there has been a shifting of views, with Republicans growing less concerned and Democrats more so. Despite GOP control of both the legislative and executive branches, two-thirds of Republicans and Republican leaners still say that the federal government has too much power, which was not the case the last time the party controlled two out of three branches of the federal government. This may be because of an ethos ingrained into Republicans by President Ronald Reagan, who famously chided government solutions saying, "… government is not the solution to our problem; government is the problem." This desire to limit the federal government has held a prominent place in Republican thinking for two generations now. While Republicans may think the government has too much power, they remain enthusiastic about the president. Eighty percent of Republicans approve of President Trump currently. Congressional approval, however, is much lower among Republicans -- only 18% approve of the job Congress is doing. It could be that Republicans believe the government has too much power due to Trump's focus on "draining the swamp," meaning changing the way Washington works rather than cutting government, per se. This Trump focus may be shifting Republicans' gaze away from him and to members of Congress and the bureaucracy who, in their eyes, still have too much power. Support for Active Government Up in U.S.
Americans are more likely now than they've been in almost two decades to want the government to take an active role in solving the nation's problems. Fewer than three in 10 Americans are satisfied with the way the U.S. is governed, continuing a decadelong pattern of dissatisfaction. Government dissatisfaction, race relations and immigration now lead Americans' top-of-mind concerns for the U.S. Economic mentions are the lowest since 2007.